It’s safe to say that Battlefield 1 is the biggest shooter of the year, if only in marketing hype terms. EA and developer DICE are taking no chances with it, pushing the game with the force of twenty howitzers at every chance they get. It’ll undoubtedly overshadow Call of Duty this winter. And that hype continues with the current Battlefield 1 open beta, which for many is their first chance at trying out the game. 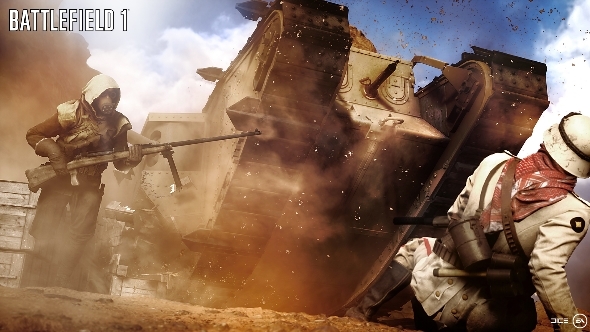 Check out wars from all periods in our roundup of the best shooters around. This beta is my first experience of Battlefield 1. For me, a lot is riding on its ability to impress. I’ve been a fan of the series since 1942 (the game, not the year), and for a long time I played every weekend. The fan in me wants Battlefield 1 to be great, to be as adored as Bad Company 2. My first impressions of Battlefield 1 are a mix of awe and disappointing familiarity. When selecting where to spawn on the huge Sinai Desert map (the only one available in the beta), the camera swoops down from the map and into first-person akin to Modern Warfare’s loading screen exits. I’m immediately dumped into the boots of an Ottoman Empire soldier struggling through a sand storm. It feels authentic and exciting, but I can’t see a thing. Thankfully it doesn’t last long, and as the clouds of sand dissipate the stunning landscape is revealed. I can’t understate how good Battlefield 1 looks. It also runs great; the frame rate counter that’s permanent in the beta reads 70fps most of the time, which is impressive considering my aging AMD 7970 graphics card. I can only manage ‘high’ settings, but that’s good enough. The rocky outcrops where snipers hide look exceptional, and the way the terrain deforms when grenades or explosive shells strike is really impressive. (It also creates DIY foxholes, which are useful for machine gunners to set up in). For my first few matches though, I can’t shake the feeling that this is just another Battlefield. In some ways that’s nice, because it makes for a familiar, comfortable experience. 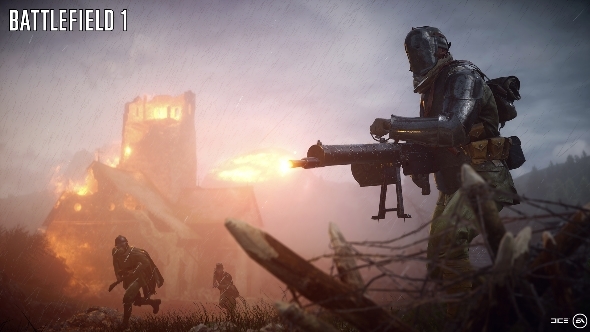 But this is Battlefield in World War 1, a conflict that had entirely different tactics to that of the modern battles the series has been working with. It should feel different. I shouldn’t be going through the same old beats of a well-worn Conquest match. But soon things come into focus. Battlefield 1 is a very different Battlefield game, just not in the broad strokes. This is not a trench warfare game. This is not a game of cavalry charges (though it does feature both, and they’re fun additions). The reinvention is more subtle, and can be mostly found in the balance of weaponry. See, the technology of WW1 was vastly different. Most soldiers used bolt-action rifles, and machine guns were predominantly static emplacements. How the game combines these approaches is its greatest achievement. Battlefield 1 does take great liberties with the tech. For example, playing as the assault class equips you with an MP-18 submachine gun. Less than 10,000 of these were made during the war, and so they were a very rare sight. They’re far more common in BF1, but crucially they’re not everywhere. Medics use the Cei-Rigotti, a semi-automatic rifle that was only ever in prototype stages during the war. It operates much like the WW2 favourite M1 Garand, but crucially it’s a single-shot weapon. 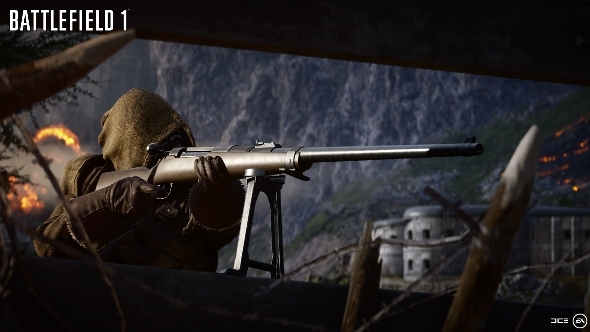 You’ll see a lot of these in Battlefield 1, along with similarly designed rifles. It means much of the game is spent engaging with slow-firing enemies at mid-range. Spray-and-pray tactics are often impossible, and headshots become significantly more important. The support class starts with the Lewis Gun, which fires relatively quickly but has an absurdly wide spread pattern, making it useful mostly as a suppression device. It’s great fun to go up against someone with a rifle; you both have similar range, but they’ve got far more accuracy than you, provided they can aim through your hail of lead. It’s this beautiful balance of weapon types that makes Battlefield 1 the game it is. Long gone is the reign of the multi-purpose assault rifle that made roles indistinguishable. Finally classes are once again built around not only their gadget abilities, but their core combat tactics too. Talking of classes, things are a little weird in that area. The new core classes are assault, medic, support, and recon, which signals the recreation of a dedicated healer and the complete absence of a vehicle-focused class. Where once engineers were fielded to use anti-tank weapons, now the assault class can use dynamite and hurl huge AT grenades. The fixing of vehicles is done by the tanker, who can only be played if you spawn as a tank. They’re a weak class on foot, armed just with a pistol and a fixing wrench, so they should be inside their vehicle at all times. Handily they can repair tanks from inside by holding X (you can’t move or fire when doing this), but I miss being able to play an engineer hopping from one friendly tank to another and topping up their HP. You’ll still want to play as a tanker though, as the Land Ships are incredible. Able to hold a crew of multiple people, they slowly crawl across the battlefield, smashing through buildings and pounding the ground with cannon fire. 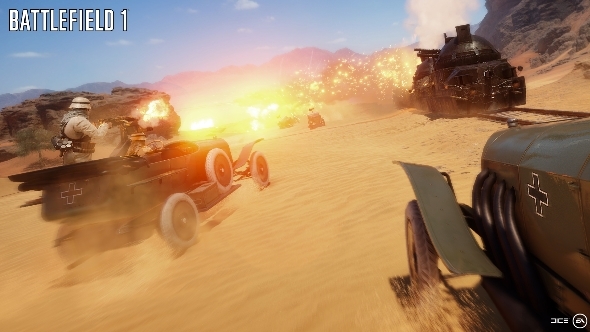 The ability to have an entire squad inside a tank changes the dynamic; it’s no longer a two-player co-op affair, but a box of chattering machine guns rolling towards the enemy. There are far fewer tanks in Battlefield 1, but when they turn up they sure are something to behold. Horseback cavalry is also in the beta, and they’re a fun addition. It basically makes you a larger but faster target, akin to a fleshy motorbike. 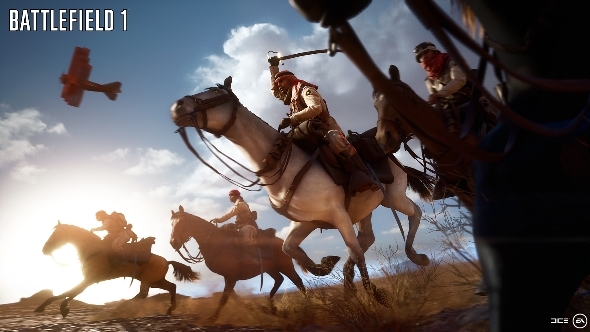 The role is played in third person while on horseback, and your officer can swing a saber to cut down enemies as you gallop by. Horses are great for charging between capture points, but I think they’re predominantly a novelty rather than a true revolutionary feature. There’s a lot to see and do in the beta. I’ve barely touched the planes, but they seem more fun than I’d expect for such rudimentary flying machines. There’s also plenty more weapons to unlock, which will further prove if DICE really have struck that balance between all the various gun types. But should what I’ve seen so far be a promise of what’s to come, then Battlefield 1 seems to be in a very good position indeed. The Battlefield 1 open beta finishes on September 8, and can be downloaded from Origin.